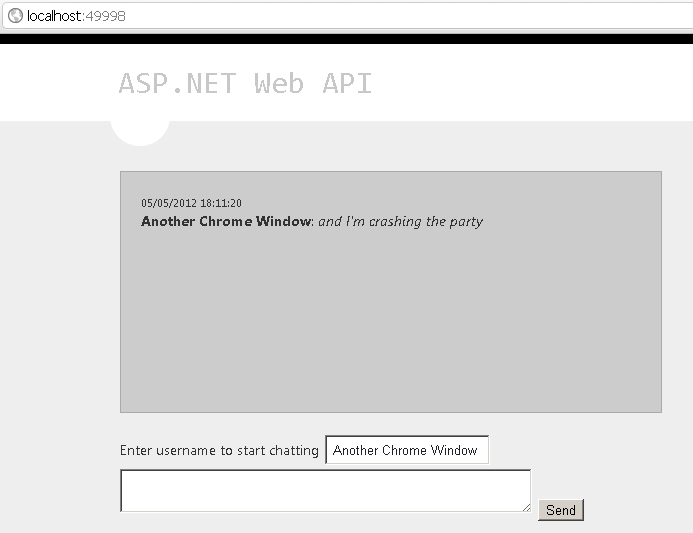 Native HTML5 push notifications with ASP.NET Web API and Knockout.js | StrathWeb. A free flowing web tech monologue. Now that we have set up the ground rules, let’s create our project. It’s gonna be the standrad ASP.NET MVC 4 with Web API template. First let’s add one Model to our application, called Message.cs. This will be the model we’ll use for model binding in our chat application. Whenever a use submits a new message for the chat, the controller method will be accepting this Type as the input. We add a new controller to our application, called ChatController.cs. In here we are going to derive off the code shared by Henrik. Note, he used ConcrrentDictionary to build the push functionality, but I think ConcurrentQueue would suffice. Our controller will expose two points of communication – Get() and Set(). Get will be used by clients to subscribe to the EvenSource stream, while Post will be used to send chat messages. When the user makes a GET request, we’ll create a new HttpResponseMessage using PushStreamContent object and text/event-stream content type. PushStreamContent takes an Action<Stream, HttpContentHeaders, TransportContext> onStreamAvailable parameter in the constructor, and that in turn allows us to manipulate the response stream. When the user makes a POST request, using model binidng we pull a Message object out of the request and pass it off to MessageCallback. OnStreamAvailable would instantiate a new StreamWriter for every new subscriber (every user of the ChatController). 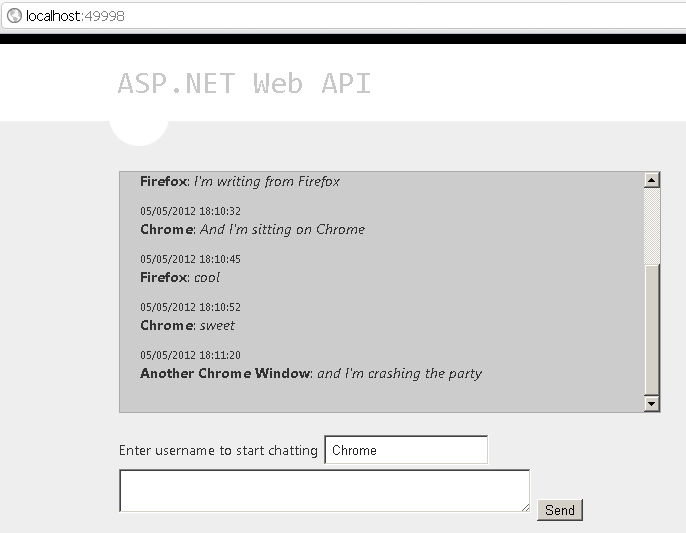 It will then queue the StreamWriter in the local private static property in the ChatController, streammessage. It will be shared accross all instances of the controller and allow us to write a new notification (push them) to every subscriber (or rather, every streamWriter corresponding to a subscriber). We do that by calliing the void method MessageCallback. As we saw before, it will be called any time a POST request with incoming Message reaches the controller. 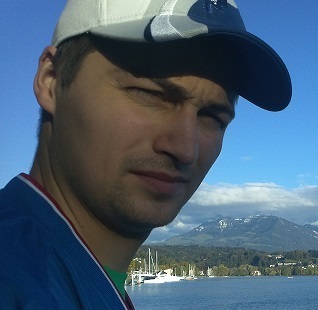 What happens inside the method is that we iterate through all StreamWriters in the _streammessage, and write to the HTTP Response using the syntax expected by the HTML5 EventSource specification which is: “data:”, then serialized JSON, and then a new line (without the new line, the streaming of data will not work). To do that, we go back to the indispensable help of JSON.NET (by now, it’s already part of ASP.NET Web API core!). Since we iterate through that collection, the message gets written (pushed) to every client that has subscribed to the ChatController using the GET method. 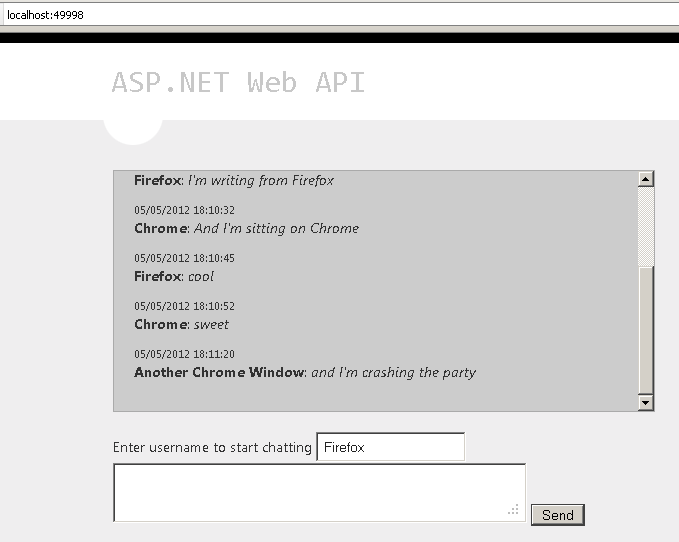 In other words, this is they key mechanism that will enable us to create this multi-person browser-based chat. Believe it or not, that’s everything we need on the server side. Let’s move on to the client side. First some HTML to have somethign to work with. Then we add our HTML. – a div with ID console. This will be our chat box. It is bound to a knockout.js template chatMessageTemplate. The template expects a JSON object with properties username, text (message body) and dt (date time). Additionally, after the template is applied we call a method resizeChat, to scroll the chat down. – newMessage will contain the new Message as it’s being composed and prepared to be sent to the server. As soon as it’s sent, the contents af this are wiped out. – resizeChat is a method to be called after binding the chat template, as after every message is appended to the chat console, we need to scroll it down, so that we mimic a typical chat experience known from any chat application (latest messages at the bottom, chat box is always scrolled down to the bottom). We apply the binidngs in the document.ready() event. The final piece of puzzle is using the HTML5 EventSource to listen to incoming data pushed out from the server. We’ll handle this in a second, but before, let’s just add the handler for message sending (upon clicking the “Send” button). When the user click the button, we’ll send the message to the server (using PSOT event, as mentioned earlier). The message itself is already data bound with knockout.js, so we don’t need to harvest any data from DOM. All that’s needed is to use the knockout.js mapping plugin to unwrap the JSON object from the knockout.js object. Additionally, we clear the message box and message text from viewModel. Now the EvenSource, which is going to act as our subscription mechanism. We’ll also add it into $(document).ready(). First we check for the support of EventSource. If that’s the case, we create a new EventSource object by passing the the URL to our ChatCaontroller. EventSource by default operates on GET request. This opens up a connection with text/event-stream” content type. Then all we need to do is add a few event listeners to the EventSource. The key event of the EventSource is the onmessage event. When this is raised, we take the response from the server and parse it to JSON, and then push into viewModel.chatMessages which in turn does all the UI updates for us. Notice the else clause there; I left that empty since I wanted to focus on native HTML5 implementation. However, there are ways of making this cross-browser. A good polyfill for that has been written by Yaffle and can be found here. You could use that as a fallback mechanism for other browsers. That’s it! Pretty simple for such a useful feature. Let’s run this using three browser instances – and there is not much to explain, you can chat between the windows 🙂 The more clients join in, the easier it is to see how nicely our chat messages get pushed out to all of them. We built here a browser-based push-enabled chat, but the mechanism shown here could just as well be used for anything that requires push notifications, for example uploading services, sites using Twitter-like message system, external API querying and many many more. As always, the source code is available. Normally I linked to a downloadable zip, but I’ve been requested to put stuff on github instead so that’s what I’m going to do. This time it’s a VS10 project. Enjoy!